All-in-one adapter with built-in surge protector allows you to plug dual-voltage appliances into foreign wall outlets. Easy to use, fits electrical outlets in the most commonly visited countries. For use in Africa, Asia, Australia, Caribbean, Europe, Fiji, Great Britain, Ireland, Middle East, New Zealand, North America and South America. Plug in your existing phone/gadget charger and this device converts it to an overseas plug rating of 110 or 220VAC. 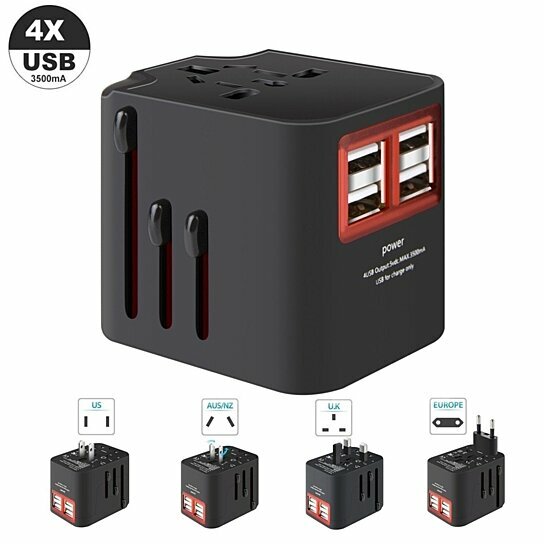 4 USB ports with 2.1 amps for high-speed charging of Smartphone and tablets, charge all at high speed with intelligent charging and auto turn off. 4 Universal pin adapter built- in to fit any wall socket in the world.